the world of paranormal research is that Thomas Edison was working on some type of device that would allow communication with the dead. This legend was started by an interview with Mr. Edison that appeared in the October 30, 1920 issue of Science magazine. on this earth. Therefore, if personality exists after what we call death, it's reasonable to conclude that those who leave this earth would like to communicate with those they have left here. . . . I am inclined to believe that our personality hereafter will be able to affect matter. If this reasoning be correct, then, if we can evolve an instrument so delicate as to be affected, or moved, or manipulated . 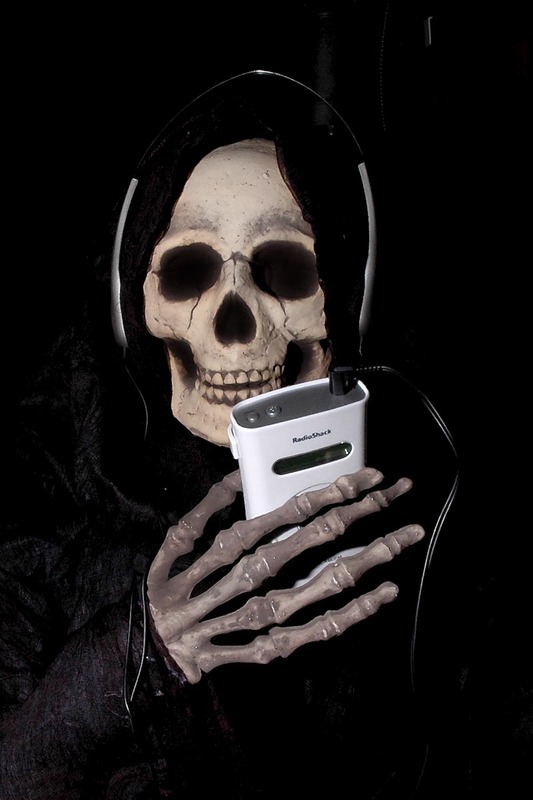 . . by our personality as it survives in the next life, such an instrument, when made available, ought to record something......"
This quote became the basis of the current claims of many different types of ways to have two way communication with the dead. However the most important fact behind this interview has been lost or ignored by those who are using it to add credibility to their otherwise nonsensical devices. In a later interview Mr. Edison made a statement as he was being interviewed by another publication that he could not believe that the story had been printed and that he was not describing anything that he was working on or ever would. He stated that it was more of a comical statement than a statement about his research. The curators of the Thomas Edison National Historic Site have stated: "This seems to be another tall tale that Edison pulled on a reporter. In 1920 Edison told the reporter, B.F. Forbes, that he was working on a machine that could make contact with the spirits of the dead. Newspapers all over the world picked up this story. After a few years, Edison admitted that he had made the whole thing up. Today at Edison National Historic Site, we take care of over five million pages of documents. None of them mention such an experiment. " They have told us at Rocky Mountain Paranormal that this is the most requested document that they do not have and has never existed. 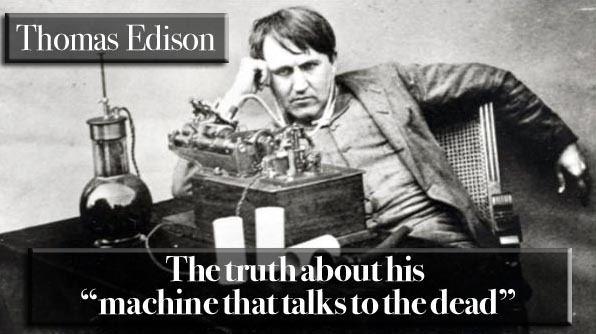 So the answer to the question "What machine was Thomas Edison working on to communicate with the dead?" can be very easily answered...... He was not. This story points out once again that people involved in paranormal research need to stop following the stories that have been told to them and actually do some research, and not rely on what other "researchers". What did Edison think about the human soul and afterlife? will put their investigations upon a scientific basis. to record whatever there is to be recorded. the survival of personality has been proved---as yet. be the cells that are the units of life. of the microscope, which vitalize and “run” our body. to a man, but they are the same entities. we do not survive death as individuals. at least assured that they themselves live forever. sistence, and so of our own eternal life. live who keep our records for us. “big peoples,” are of various degrees of intelligence. seem to be impressed by the startling and the unusual. The thing is remembered that makes an impression. his eyes were perhaps three feet above the sill. the little peoples that live in the cells had not changed. of the little people in the fold of Broca began to stir. they had heard about those window sills before. them without pulling himself up! cudgel our memories for the things we want to recall. groups of little peoples who have the records we want. committed since the beginning of time. ences are carried forward into succeeding generations. hands. upon the limbs of trees. along with them. Take an Indian baby, for instance. origin of life to be fundamentally wrong. think the elephant a unit, that it is just an elephant. does. But it is only seeming. tion of community, not of individual effort. to exist. Life does not cease to exist. individual, and select some other habitat or habitats. thing else or many other things. get something out of nothing. Life can’t make life. Life is. It is not made. to the conclusion that it is not true. life.” Real life is not lost at all in such a struggle. erroneously have called the individual. Very well. That must depend upon the fineness of matter. size to be very complicated? ible through any existing microscope, is possible. away. Who built the new in duplicate of the old? bridge had died and nature had grown a new one. the inadequacy of our power of observation. reverse occurs. The theory explains many things. “individual”----the aggregate called a “chicken”s. the shell, and appeared, a fully developed baby fowl. to believe, entered this egg from the outside. explain the situation as it really is. regard to the creation and the genesis of man. dreds of cases of extraordinary significance. ematician who is very expert. between movable and fixed life. form in order that they may get food conveniently. aggregate which has been built by a group of insects. appeared, and quite a different type came into being. wool unnecessary, wool, then, is dispensed with. say, fifty thousand years. Then comes a variation. that daisy must be responsible for the change. produce something which really will be reasonable. must be a group of organisms---a fixed commune. thought with regard to these and kindred subjects. of the origin of species. any of the vital processes. It is controlled by them. meet the conditions which exist outside the body. The brain is occupied by the high-class workers. after body-death, our personality still lives. ages. Then what shall we be? didn’t go to bed till half-past eleven or midnight . there is artificial light and he will improve. while they are in this mental state, really has occurred. which seem so silly to the scientist. which have left this earth to communicate with us. ratus which should make communication very easy. of the kind we think about and imagine goes down. mendous sensation if it is successful. personality to survive, don’t we? available, ought to record something. as they would pass through the air. flowers or other plants is not so very great. repeatedly disproved in recent years. of their existence on this earth. remains in our bodies at the end of seven years later. ment.” This is true, at least up to a certain point. of mammoth animals of prehistoric days has proved. to speak, for the carrying on of their functions. in its changed habitation, or environment. I CANNOT conceive of such a thing as a spirit. which have passed on to another existence or sphere. electricity, chemistry, and other fields. as we know it in this existence. I believe that life, like matter, is indestructible. this world and there will always be the same amount. the tasks which I am about to mention. Yet why not? act as a community or ensemble rather than as units. you wish to call it, of our entities. Of course, you say, it is nature. But what is nature? satisfied with that word “nature”. house see that the machinery is kept in perfect order. leave little more than an empty structure behind. life and still new life for each generation. building those crystal? They don’t simply happen. form certain kinds of crystals. is in that part of the brain known as the fold of Broca. simply the departure of the entities from our body. very much fear that our personality does not survive. the results with the keenest interest.